The reason we originally set up our activity centre and campsite at How Stean Gorge was due to the awe we felt when we saw the gorge for the first time. Such a beautiful part of the Yorkshire Dales that was completely carved out by nature. 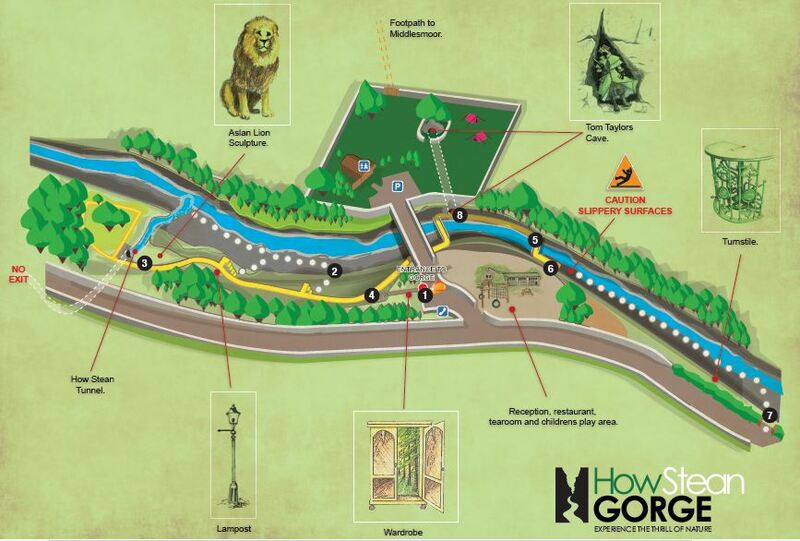 We wanted to share with everyone the wonder of the gorge and the caves underneath it so we have created a map with a safe route through it. Armed with a hard hat, torch and sensible shoes you can explore this little hidden gem which has been here for 10 thousand years, since the last Ice Age. The gorge limestone is so special that it is graded as a SSSI – a Site of Special Scientific Interest. 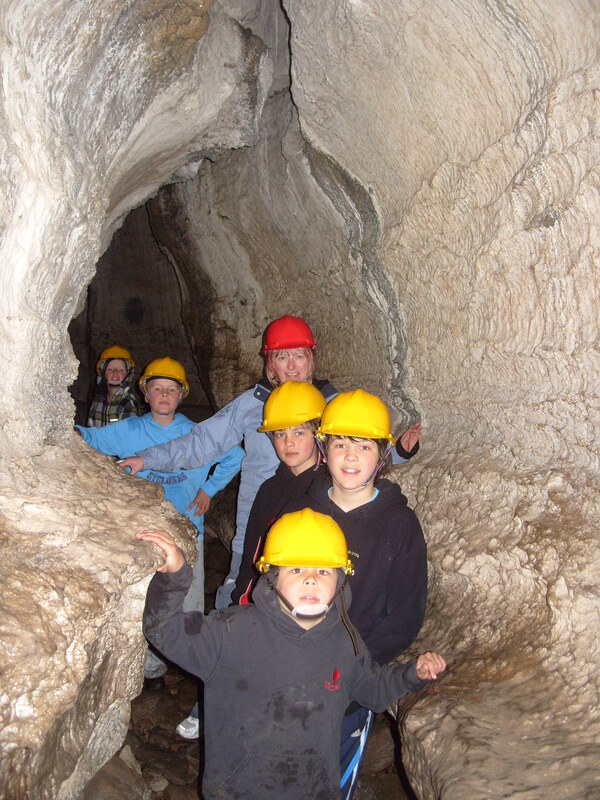 The walk through the caves takes you past lots of attractions that we think are some of the most beautiful and unique parts of the Yorkshire Dales. The gorge is being slowly worn away by water erosion but also takes it’s shape from man when workers quarried the upper and lower parts of the ravine. With a ticket from our shop, you can wander along the trail adjacent to the beck. The upper pathway is suitable for the timid adventurer, the lower are more challenging as they are uneven and occasionally slippery. We have made these trails to suit people of all sizes and abilities. This makes it the perfect family day out in Yorkshire and a great way to see a beautiful gorge completely created by nature! Along the way you may encounter a large spider and some lizards! These works of art are by iron sculptor Steve Stangermoor from Harrogate. Another sculpture on your journey is that of a lion. Not any lion but Aslan from “The Lion, The Witch and The Wardrobe” fame by C S Lewis. 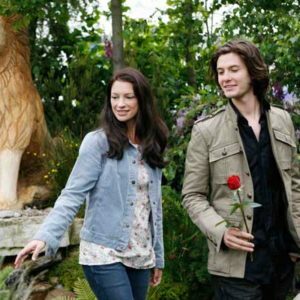 When the film “Prince Caspian” was released in 2008, to promote the film, Disney commissioned Marney Hall to design a garden at the National Exhibition Centre featuring Aslan in Narnia. The lion was carved by David Williams, from Buith Wells, using a chainsaw. After winning a gold prize at the exhibition, we took the opportunity to purchase the lion and placed him where he now proudly stands. He is an exceedingly well made lion in solid oak and extremely heavy. As you will see, there is no road to his dwelling and he had to be manhandled down the path and set in concrete. Well, you only have to do that once, don’t you? No! Liverpool Cathedral was aware of him and wanted to have him sit in the Church of England Cathedral for a couple of weeks as the were having a Narnia Exhibition. The Chronicles of Narnia are based on stories of the Bible – good fighting evil. So, the carving was dug up, heaved onto a trailer and dragged off to Liverpool to return back down the path and finally set back into stone where he now rests. 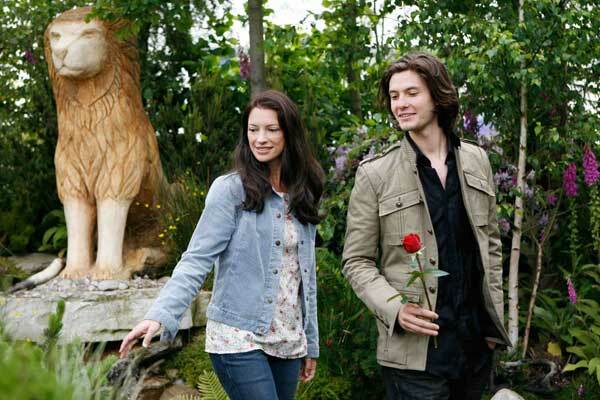 When the garden was designed at the NEC, Marney Hall planted beech and yew trees and featured rocks and running water so Aslan is very much at home where he is. You will need a basic fitness level to walk along the uneven pathways and steep steps and caves. 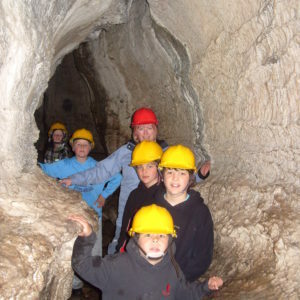 How Stean Gorge is a spectacular limestone ravine carved out over thousands of years by waterflow and is the perfect location for a family day out as well as outdoor activities like via ferrata, gorge walking, caving, rock climbing, canyoning and abseiling. It is geographically unique, as it’s one of the only places in the UK where you can comfortably enjoy both rocksports and canoeing – in a single day. It is also a Site of Special Scientific Interest in Nidderdale, An Area of Outstanding Natural Beauty – why choose anywhere else? Of course! The paths are ideal for children to explore as there’s no straight lines and it’s bumpy in places. It is a superb natural feature so small children will need to be supervised as there are shear drops and ledges. Those who do not wish to go down into the gorge can watch some of the activity from the bridge or while away the rest of the time enjoying refreshments in our licensed café. You will just need comfortable clothing and flexible footwear with good grips. Hard hats are provided. You can bring your own torch or purchase one from the shop. We recommend you bring clothing suitable for the days prevailing weather.